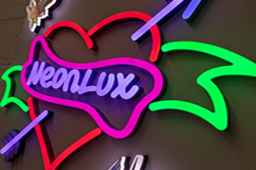 Manufactured from block acrylic, our faux neon range, NeonLux LED replicates the appearance of traditional neon. Robust, energy efficient and virtually maintenance free. 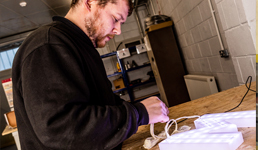 Manufactured in the UK by Applelec, our versatile LED panel, LED Light Sheet is created to bespoke specification and can be integrated into retail, hospitality and external applications. The vast majority of our built-up metal letters are created by hand by our highly skilled metal fabricators, who through time-honoured expertise deliver precision manufactured products. Recreating all the charm of a vintage fairground, Applelec's range of energy efficient, cabochon LED bulbs can be integrated into our built-up metal letters. As a supplier of LED solutions, Applelec is now the sole UK distributor for SloanLED LED modules and LED systems. Take a look at the lighting range. Our product range has evolved through over 20 years of innovation and experimentation. We pride ourselves on the quality of our production, craftsmanship and customer service. 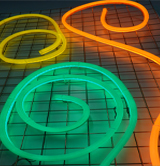 Applelec’s faux neon range is manufactured from block acrylic providing a studier alternative to fragile, glass neon. With thermally managed LEDs the faux neon system runs cool to the touch, making the illuminated signage ideal for low level installation. Applelec is delighted to announce that we are the exclusive UK distributor for SloanLED, supplying the full range of LED modules and architectural lighting. Roll up and see Applelec's energy efficient, fairground LED cabochon letters. For this year’s Winter Lights festival in central London. Applelec announces reaching a phenomenal milestone in business as we celebrate 20 years of successful trading.